Conversation with Werner Fossmo’s in his residence. 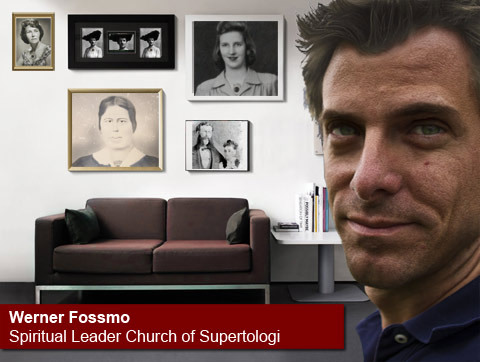 Is it correct that you are the leader of the Supertologi Church? …and Jenny Moore was a member? Jenny was an applicant to the church, and I was Jenny’s personal spiritual leader. So you knew each other well? How long has Jenny been involved with your church? I have received information that Jenny Moore donated large amounts of money to your church. Yes, that’s correct, but that’s not criminal, is it? No, it’s not. Lately the donations seem do have decreased pretty drastically, right? You’ll have to ask the accounting department about that. I don’t keep track of things like that. Her contributions corresponds to half of the church’s budget, you must surely “keep track” of that? Is it correct that all members of your church must leave all of their assets to the church when they pass away? Yes, I’m sure it is. But like I said earlier, Jenny was an applicant to the church and not a full member. You can only be a full member after five years of application. Jenny would not have become a full member until the summer. When did you last see Jenny? A week before she died. According to my information you received the code to the house the evening she died. Yes, that’s correct. I intended to visit her, but other things came up. We decided that I would stop by the following day instead. So you never went to Jenny’s house on February 21? Where were you the evening of February 21? I went out to dinner with my wife. Then we went home. We watched a little TV and went to bed at midnight. My wife can confirm it. One last question. Were you and Jenny Moore ever romantically involved? I am a married man! No! We were never been romantically involved.